Graham crackers. Animal crackers. Cheese and crackers. Crackers in soup. Crackers and hummus. Chips and dip. Chips and salsa…..
Crackers and chips are two of the snack staples that often end up on the chopping block when you give up carbs, swear off gluten, or clean up your diet. If a change in your eating habits — whether it’s for a gluten-free, Paleo, ketogenic, or low-carb diet — has you missing crackers and their crunchy brethren, you’re in luck. 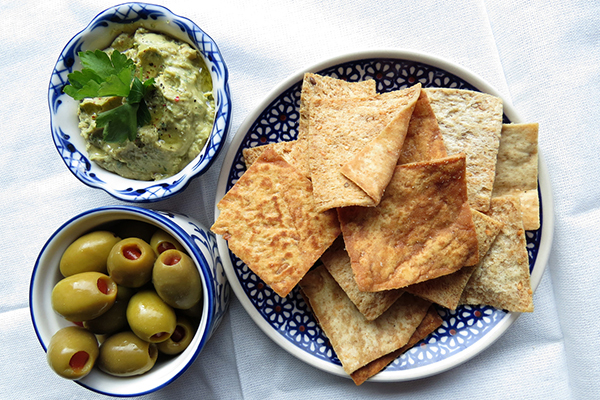 We have 16 alternatives to crackers (and chips!) you’ll love. These little bites are a perfect swap for traditional crackers laden with refined and processed white flours, salt, and oil. They’re also a more nutrient-packed way to satisfy all your crunchy cravings. With sweet and savory options, your crunchy, flavor-packed snack dreams are about to come true. Replacing your favorite foods with cleaner versions is a real test for your creativity in the kitchen. Thankfully, there are plenty of crunchy swaps for chips and crackers that save on carbs, calories, and/or fat. First, ask yourself why you’re craving those foods: is it the crunch, or do you want a dry and salty snack? If you want to keep your mouth occupied with a crunchy snack, the easiest swap is raw veggies. We know that might not work for everyone, every time you crave chips or crackers. But if you just want a vehicle to get guacamole, hummus, or both to your mouth, veggies are a suitable sub. If you’re chomping on them on their own, you can add a sprinkle of your favorite seasoning blend for extra appeal. Endurance Crackers: This seeded cracker is vegan, and it cleverly uses chia seeds as a binder. Spice them up for a filling snack. We love them as is, or with an added teaspoon of chopped fresh rosemary, thyme, or curry powder. Keep in mind that these are calorically dense, so a little will go a long way. If you’re following Portion Fix, one cracker is orange orange container. Baked Corn Tortilla Chips: We haven’t forgotten you chip lovers out there — sure, corn is a starchy vegetable, but these are baked so they’re lighter in calories and fat! These homemade corn chips clock in under 100 calories, and they take only 10 minutes to make. Bring on the queso! Kale Chips: This crunchy, savory snack is a win-win. It sneaks in a serving of dark leafy greens, and it tastes delicious, too. Spiced Nuts: Turn simple nuts into a crave-worthy snack by adding cumin, cinnamon, and cayenne. Bonus: They have only 106 calories per serving. Maple Chai Roasted Chickpeas: Chickpeas are a versatile pulse. They can be coaxed into creamy hummus or baked to crispy perfection. You’ll love crunching on these! Cinnamon Spiced Popcorn: This 21 Day Fix-approved popcorn gets a dose of flavor from spices, and you can customize it with your favorite seasoning combos. Apple Chips: Craving something sweet? 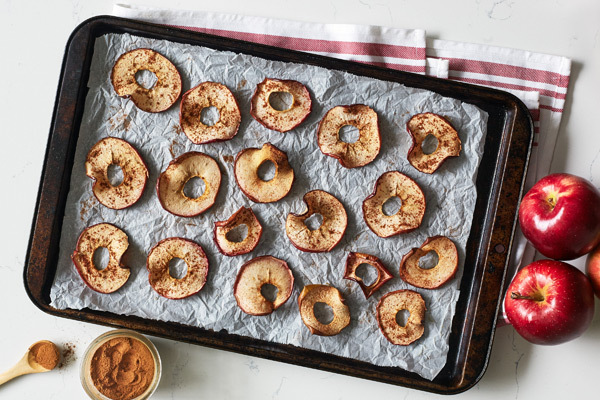 Try these thinly sliced apples sprinkled with cinnamon, and baked to a crisp. Bonus: They count as a purple container in Portion Fix. When you have a hankering for something savory but not necessarily crunchy, reach for these instead of chips and crackers. From sweet potato and zucchini fries to stuffed mushrooms and salmon jerky, we have a savory snack to tickle your taste buds no matter the occasion. Cauliflower Bread: OK, so it’s not crunchy, but this grain-free bread is about as savory as can be. It would make a tasty swap for crackers alongside a serving of tomato soup. Spinach and Cheese Stuffed Mushrooms: Craving spinach and artichoke dip? Try these instead. They’re just as cheesy and packed with spinach, and they have only 51 calories per serving. 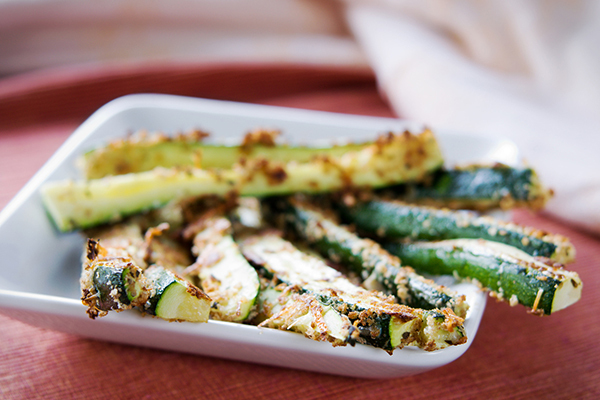 Zucchini Fries: Move over, zoodles! This warm and crunchy side dish is guaranteed to “squash” your cravings for only 74 calories per serving. You can use this same technique for other veggies, like carrots, parsnips, summer squash, or even butternut squash. Spicy Sweet Potato Fries: Spicy and sweet? Yes, please! These sweet potato fries are awesome on their own or dipped into Skinny Buffalo Chicken Dip. Sweet Potato Skins with Turkey Bacon and Tomatoes: Speaking of sweet potatoes, pack yours with turkey bacon, Greek yogurt, and tomatoes for a healthier spin on a sports bar favorite. Salmon Jerky: This high-protein snack is a real winner, and it’s easier on your wallet than store-bought jerky. Boldly spiced and easy to prepare, this snack is chewy and satisfying. Chips and crackers can have a place in a healthy meal plan, especially if you choose lower-sodium, baked, or homemade varieties. But if you’re watching your carbs or have a dietary restriction that takes them out of your healthy eating equation, try one of the satisfying swaps we’ve shared instead of diving into a greasy bag or salty box of snacks. The oils used in chips tend to be less healthy than the fats found in some of these alternatives. Need more snack inspiration? Try one (or more!) of these 55 snacks under 150 calories or these healthy snacks from FIXATE.